Oregon’s Tillamook Air Museum, housed in Hanger B, a former military dirigible hangar, the largest clear-span wooden structure in the world. Photo courtesy of the Tillamook Air Museum. I don’t know where I’m going. My driver won’t reveal our destination. But he promises me I’m going to like it. The driver is one of my oldest friends, Portland native Jeffrey Neal. Jeff picked me up a few hours ago in The City of Roses, at the recommended Hotel Fifty, with an air of gleeful secrecy, and we hit the highway towards our mysterious destination. The green magnificence of Oregon rolls by as we head west towards the Pacific Ocean. If you don’t know your destination, then you had best enjoy the journey. And there is no better state in which to do that than Oregon. Two hours later, we emerge from the trees into an immense patchwork of farm fields surrounded by hill-covered forests. Near the center, my guide pulls the car to the side of the road. We get out, and he gestures to a distant barn at the other end of a green parcel of land with the words “Air Museum” painted on the side. 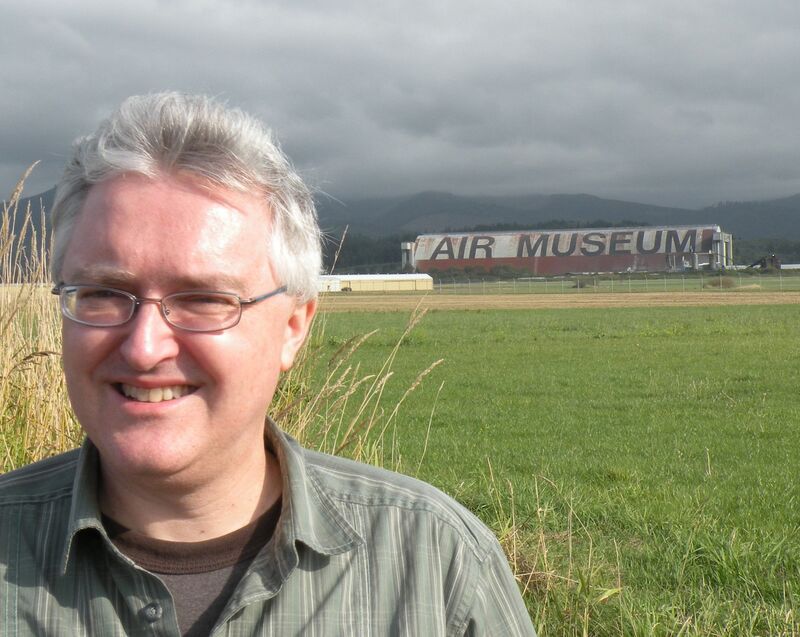 Jeff Neal in front of the Tillamook Air Museum. Photo by Robert Bundy. “There it is!” he announces. He’s grinning at me, waiting for my reaction, barely containing his laughter. Something’s up. But what? Then it clicks. The tiny shapes in the foreground are airplanes, of course they are. Now that I can roughly measure comparative scale, I realize that the long barn with “Air Museum” written on the side is actually much, much farther away from me that I had initially thought. I later learn that the letters spelling out “Air Museum” are each 100 feet tall and 30 feet wide. “My Lord, that thing is huge!” I finally exclaim. Jeff laughs as I figure it out. 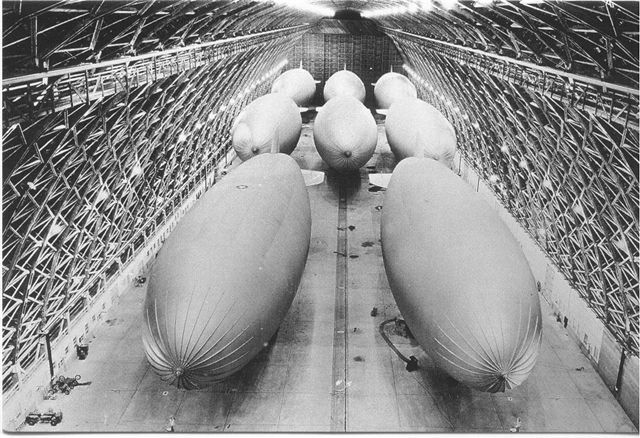 Hanger B housed eight dirigibles, each 216 feet long, ready to take the air to search for Japanese submarines during World War II. Photo courtesy of the Tillamook Air Museum. We are standing about a mile away from the Tillamook Air Museum in Oregon. The privately owned museum—one of the best of its kind in the country—contains a collection of more than 30 vintage flying machines from the United States, Britain, Germany, France, Poland, Russia, and more. 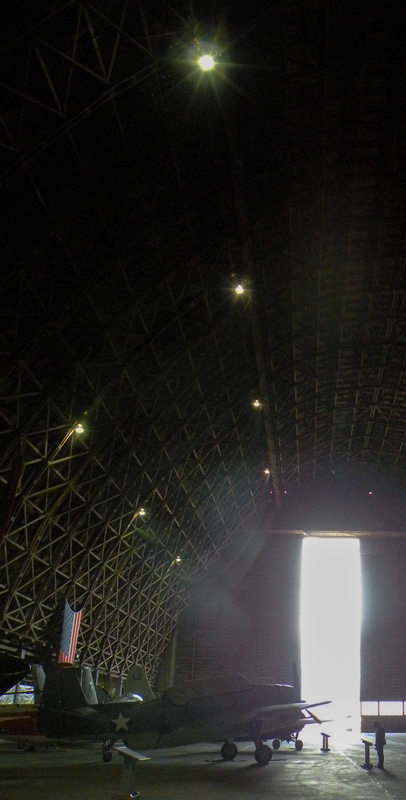 All are housed in Hangar B, a former World War II military dirigible hangar, which is also the largest clear-span wooden structure in the world. I ask my tour guide if he trots out this optical illusion for all the out-of-towners he takes here. In response, he grows serious. He confesses that he has never been here before, but knew of it. One of Jeff’s degrees is in history, so he knows it well, but only through pictures and stories. My old friend then explains that his late father was one of the men who helped build this gargantuan structure, made to house no fewer than eight helium dirigibles—each of which was 216 feet long—that scoured the Pacific coast in search of lurking Japanese submarines during World War II. Jeff’s dad died when he was young. While his father spent over a year in Tillamook doing this important work, Jeff had never made his way here to see what his father did during the war. Until today. It dawns on me that I’m being honored by my inclusion in what, for him, is a personal pilgrimage. 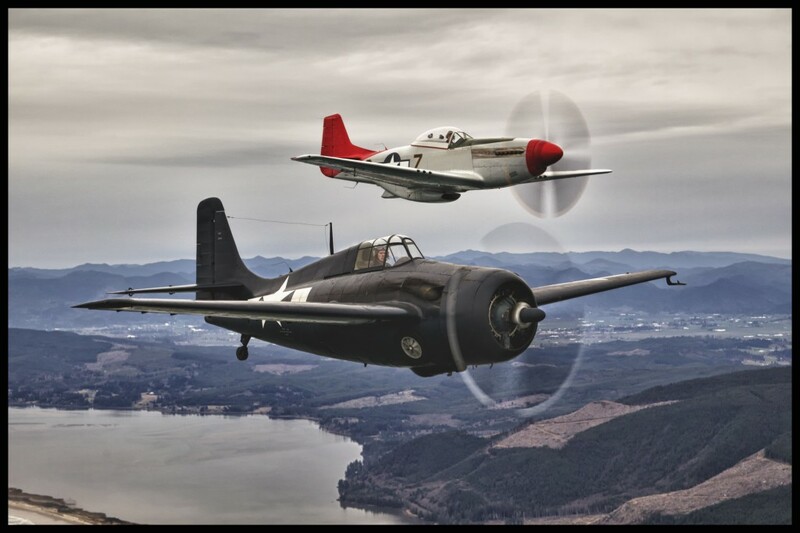 A Wildcat and a Mustang from the Tillamook Air Museum take to the skies over the Oregon coast. 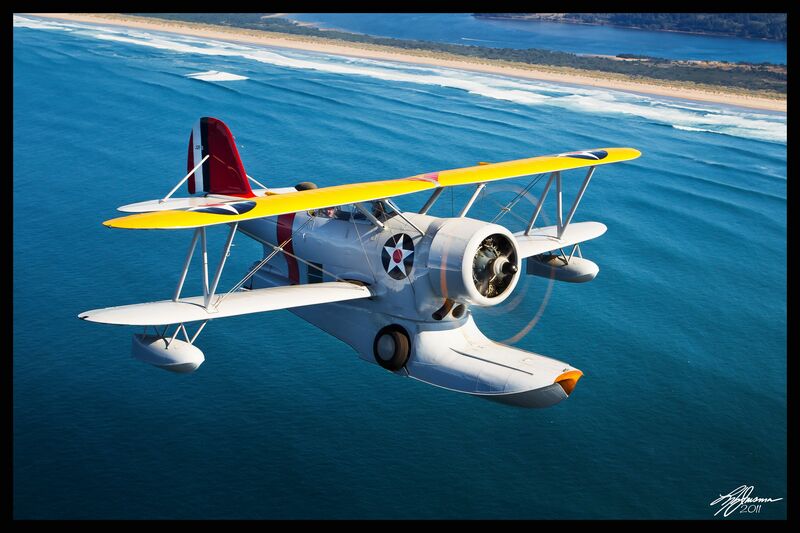 Photo courtesy of the Tillamook Air Museum. As we enter the hangar that houses the collection, I’m once again struck by the sheer scale of the place. The hangar contains more than seven acres of space, is 192 feet tall, 1,070 feet long, and nearly 300 feet wide. The two massive steel doors are 120 feet tall and weigh a staggering 30 tons each. But all those numbers cannot convey the awe you feel when you step inside of it. I sneak a look at my old friend and his eyes are cast upwards, taking in the intricate framework of the Douglas Fir interior construction. Is he trying to imagine his father putting those huge puzzle pieces into place? I don’t want to ask, and he doesn’t say. But he’s infected me with the feeling that we’re stepping into a church. No—better—a memorial. Just when I’m about to ask him if he needs a minute, Jeff the Historian takes over and tells me exactly why this museum is so special, starting with the structure that houses the collection, Hangar B. The existence of Hangar B is remarkable enough, Jeff tells me, but, originally, there were two identical hangars here, side by side, built one right after the other. Hangar B took nine months to complete, as the engineers were struggling to solve logistical challenges as they went along. Once the first was completed, the second, Hangar A, was assembled in less than half that time. The collection includes a P-38 Lightning, also known as “The Forked-Tail Devil”, one of the few left in the world still capable of flight. Photo courtesy of the Tillamook Air Museum. Another aspect of the hangars that make them a uniquely Oregonian story is their wooden structure, drawn from old-growth Douglas Fir trees that were felled onsite and in the surrounding forests. The scarcity of steel during wartime necessitated the use of other building materials, and Oregon had an abundance of fir trees. But no one had ever before created a wooden, clear-span structure on such a massive scale. The builders had no precedent to follow, only theories. Yet they accomplished it. Using this design, the Navy built a total of 17 hangars along the western coast of the United States, but Hangar B was the first. Most have been torn down since. Hangar A was lost to a fire in 1992. Hangar B is the only one that remains open to the public. For now. The Air Museum’s collection is a diverse one, with some wild designs, many of which date back to the early 1930s. Walking past the still, silent formations, you can follow the fits and starts of the evolution of aviation—including some memorable, and downright odd-looking, specialty planes—all the way up to a fighter jet that saw duty in the first Iraq war. Unlike some museums where you are kept at a distance from the planes, here you can see them up close. A Grumman J2F-6 Duck, an amphibious aircraft from 1936. Photo courtesy of the Tillamook Air Museum. Among the museum’s treasures is an extremely rare Nakajima Ki-43 Hayabusa, few of which survive today as they were used as Kamikaze suicide aircraft toward the end of the war. The one on display here was recovered from the Kuril Islands, north of Japan, and painstakingly restored to flying condition. 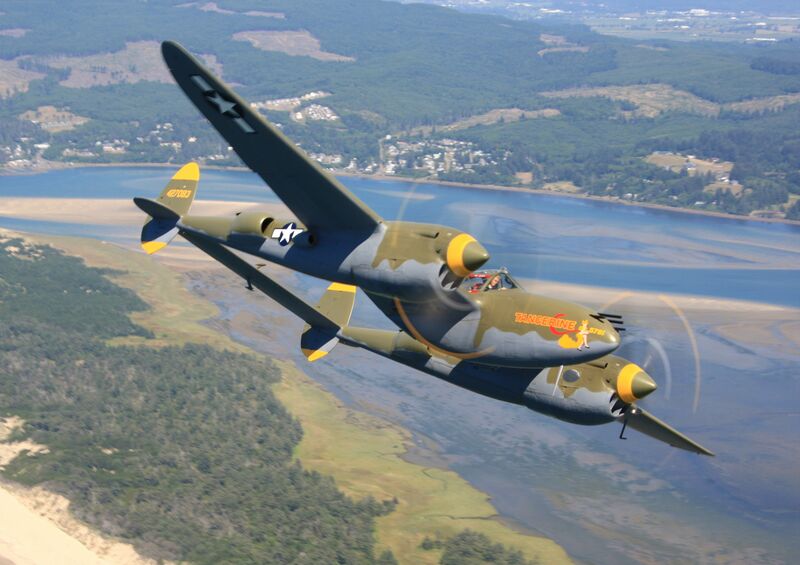 Another particularly rare bird is their P-38 Lightning, one of only a few that are still capable of flight. The museum also claims the only remaining 1938 Bellanca Aircruiser, a single-engine aircraft, reputed to be the most reliable plane of its type ever constructed. How ironic then, that only one remains. They have a Messerschmitt, a Corsair, a Catalina Flying Boat, and so many more. 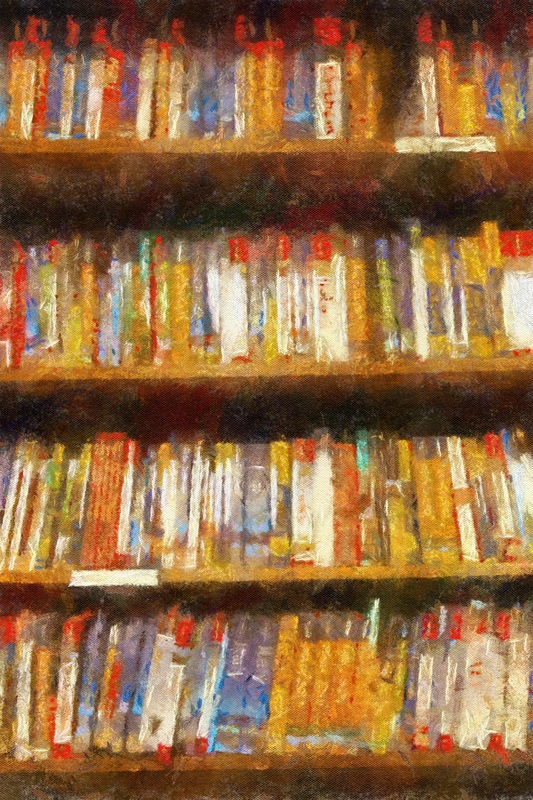 We study the planes and read the plaques that tell their stories. The aircrafts look beautifully preserved. They all stand parked at the ready, as if a pilot might walk up at any moment and fly one of them back to the antique era from whence it came. Tillamook today is famous for dairy farms and the making of excellent cheese. It’s a strange juxtaposition to see this collection of war machines—with all of their ferocious potential—quietly interred in this bucolic setting. It’s like visiting a field where long ago a terrible battle took place, only to find it now covered in wildflowers. I can think of no finer place for weapons of war than in a museum surrounded by peaceful farmland. A visitor to the Tillamook Air Museum, dwarfed by one of the enormous doors to Hangar B, reads a memorial plaque about a vintage war plane. Photo by Jeffrey Neal. In one wing of the museum is a small theater presenting a short documentary film about the historic building of the hangars. The film details the challenges faced by the men and women who left their families behind for the sake of their country. Grainy black-and-white film footage shows the workers slogging through knee-deep mud and scaling the dizzy heights of the curving rafters as they work. My friend is hanging on every word, his eyes searching every frame. I know he’s hoping that somewhere in that old footage he might catch a glimpse of the father he lost too soon. The narrator closes the film with a solemn tribute to the people who worked so tirelessly to build what had never been built before. I glance at my old friend and see he’s holding his breath. In the dim, flickering light of the old newsreel footage, his wide eyes and open-mouthed expression make him look like the boy he once was. Back on the screen, the long-vanished airships ascend toward the heavens. Story by Robert Bundy. Photos by Robert Bundy, Jeffrey Neal, and courtesy of the Tillamook Air Museum. 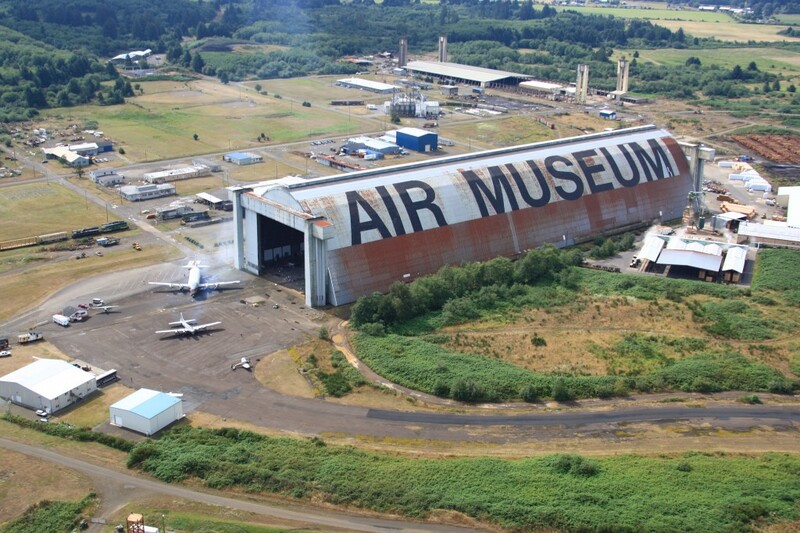 The Tillamook Air Museum is located at 6030 Hangar Rd., Tillamook, OR 97141. Please note that they will be moving to a new location in 2014, so you have about 18 months to get down the road from Portland towards the Pacific Coast to see this fine museum in its current location. See it in this historic home while you can. At the recommendation of a friend, I stayed at Hotel Fifty in Portland, and my friend was spot-on. Hotel Fifty is a truly stylish, design-forward reinvention of a mid-century hotel, and is central, cool and comfortable. Make sure you take a meal or two at H5O Bistro & Bar downstairs during your stay. They do a terrific breakfast (try the house-smoked salmon hash with poached egg, crispy new potatoes, smoked salmon and avocado pureé) that will fortify you for your scenic drive towards the coast.